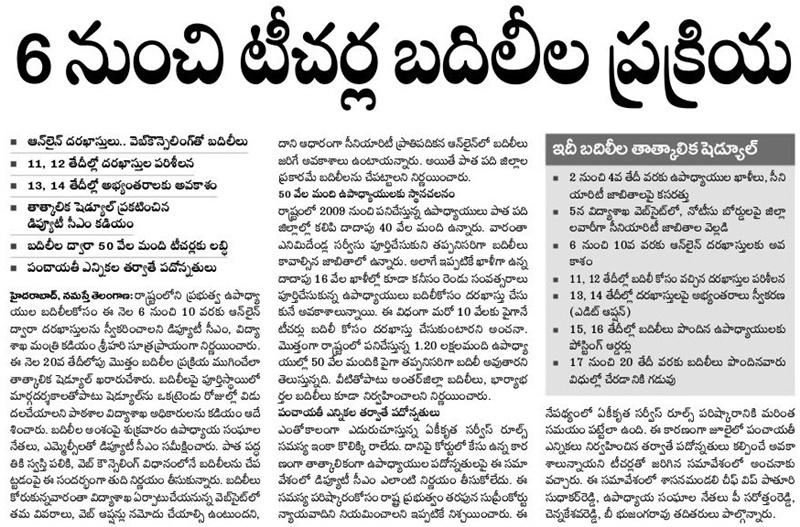 The teacher transfer schedule was released by the Telangana state government. The TS teacher transfer session was held after state bifurcation in the year of 2015. Recently, in the month of April, the meeting was hosted by minister Kadiyam Srihari regarding the teacher’s transfer and how to implement it. In this meeting, various aspects of teacher’s union problems, language teacher’s problems, and various other issues in schools were discussed. Recently, the union has passed the order to complete TS Teacher transfer related issues before the Teacher Recruitment Test (TRT) in the state of Telangana. Optional holidays and Casual leaves will be same as the old system. The complete service rules problems will be solved before and then the transfers, promotions will be implemented. Language Pandits and PET posts up gradation. Service rules, transfer rules, and other Teachers union plans.